This robust Ceanothus has pure white flowers and has large seed pods. It is early flowering, sometimes as early as December and blooms heavily. It has an erect form and reaches up to 15' in height, and about as wide. 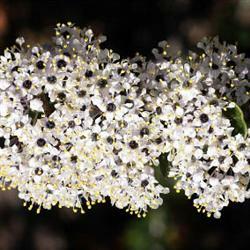 It is native to the chaparral near the coast of Santa Barbara to San Diego.It can be trained into a small tree and may be suitable as an espalier plant. Provide well-drainng soil and minimal supplemental water.